The BONSAI URN is the eco-friendly portable cremation urn which gives you a new option to honor your loved ones cremated remains with growing memories. 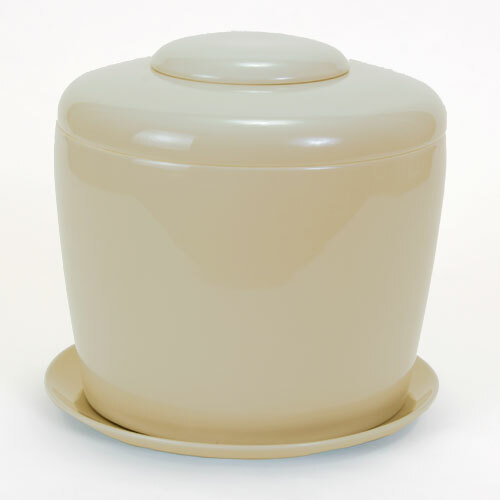 This beautiful porcelain ceramic cremation urn utilizes our patented growing system that allows you to grow a lovely Bonsai Tree or other plant of your choice. The roots will slowly grow into the cremated remains, adding sustenance to the environment and your loving memories. The Bonsai Urn is eco-friendly and is designed to store the cremains of people and pets. The hand crafted porcelain BONSAI URN gives you a "portable green solution" to memorialize your loved ones with a simple, attractive way to grow a Bonsai Tree or plant from cremated remains in a compact, portable ceramic pot with a patented growing system inside. No worries about moving, renting or outside growing spaces. The Bonsai Urn can be placed indoors near a window, grow lamp or outside on the patio, deck or special garden area. The patented integrated growing system has separate chambers to hold the Bonsai Tree or plant, cremains and growing medium. The BONSAI URN allows you to "grow life" from the cremated remains of your loved ones with a Bonsai Tree or plant inside a compact, portable ceramic pot with our patented growing system.